The record books show that he is the only man in the Munster squad who has won a European medal with the province, the photos say he was there and somewhere in his father Ger's house he has the medal to prove it. 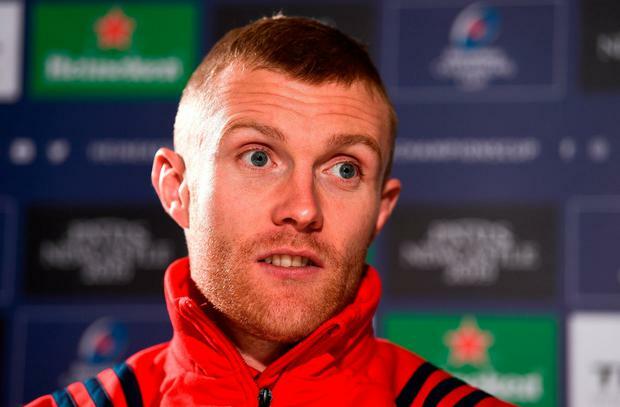 But Keith Earls feels little connection to his piece of the province's history given he was an unused sub on that famous day in Cardiff in 2008 when his home province claimed their second Heineken Cup in three years. Naturally, he was delighted for his team-mates, but without contributing on the field he still feels a sense of being peripheral to that success. Eleven seasons on, he is a leading figure in a new Munster team still toiling at the coal-face in the hope of joining the teams of '06 and '08 in lifting the trophy. Indeed, Earls yesterday revealed that he visualises that success on a daily basis as he strives to follow up a ridiculously successful year in Irish colours with some long overdue silverware at provincial level. "It's all I think about every day," he revealed. "I've ticked a few boxes the last couple of years with Ireland, and more recently two weeks ago against New Zealand, and we'll concentrate on every game there is. "But Europe is the ultimate here as well, so we'll work towards that. "The main thing is there's loads of lads who've signed up who all have the one goal as well. "Ever since I saw the '06 team winning Europe was on my mind and we're a club with great tradition in Europe and it's been a long time. "Leinster have been leading the way and speaking to the lads when we're in Irish camp, some of the stories they have and the bond they have from winning stuff, that's something we're looking for." That goal has been the same since Earls first came into the squad, but after a strong summer of recruitment and the retention of a host of key names - 12 more of whom signed on yesterday - there is a renewed sense of optimism around Thomond Park. After losing Donnacha Ryan in 2017 and Simon Zebo this year, it looks like they'll hold on to all of their heavy-hitters at the end of this season in what can only be interpreted as a vote of confidence in the direction the province are heading under Johann van Graan. The most experienced man in the dressing-room, the Rugby Players Ireland player of last season is excited by the potential in the dressing-room as they look to take full control of Pool 2 of the Heineken Champions Cup with victory over Castres on Sunday. "There's a great buzz around the squad," he said. "There's a great squad there as well, probably something we didn't have the last couple of years was strength in depth and there's a good buzz and a couple of new fellas in who are hungry. "They got the taste of Thomond Park a couple of weeks ago against Gloucester and they're mad for more. "The commitment is brilliant, it just shows that we are building a squad to move on to great things hopefully. "There's a good bunch of them there that are home-grown, which is brilliant. This is where they want to be. "Conor (Murray) signing up as well, it's brilliant that he's the best player in the world and he wants to play his rugby here and win trophies here which is a massive boost for us." Now 31, Earls feels as strong as he ever has and his hat-trick against Edinburgh after a successful November showed he is in fine fettle going into the pre-Christmas back-to-back games against the Top 14 champions. "I'm feeling good," he said. "All the niggles out of the way. I had a bit of a hamstring before the Exeter game and got back in then. "I've played three or four games now so the lungs are getting there as well and hopefully the next couple of weeks it will push on again. "It is massive pressure the next two weeks, but it's great to have them in Thomond Park first because Castres is an awful tough place to go. "If we can get a result it might take some bit of pressure off us going over there next week. They're a passionate team. They don't have superstars. You get the feel that it's all about the community with them. "They won the Top 14 last year and it's been a while since they've been in the knockout stages or pushing for Europe. They are probably putting all their eggs in one basket in Europe (now). "It's going to be a massive challenge for us, end of story, no matter what team they send over. They're a good quality side." This is familiar territory for both clubs who have met 14 times in this competition. Two of those encounters came en route to Munster's first European title in 2006, when the Irish province won home and away. Earls may be the last playing link to that team, but he's not one for dwelling on that success. "I have a medal, yeah, I think I'm the only one still from '08 but I wouldn't consider it as a winner's medal, I had no interest in keeping it, my old man has it somewhere," he said. "I never really got on the pitch but it was great to be involved. But in my eyes I've no medal, you know?" You get the sense he'd feel very different about things if he and Munster get to the podium at St James' Park in May.